After President Trump sent a tweet endorsing the outsourcing of American jobs to foreign workers, Protect U.S. Workers attorney and Trump rallier Sara Blackwell said she cried. The tweet took outsourced American workers who put their faith in Trump’s economic nationalist agenda off guard. They have yet to see major wins from the administration on the issue, but remained hopeful that the president was on their side of the issue, not on the side of tech plutocrats like Facebook’s Mark Zuckerberg and outsourcing billionaires such as IBM’s Ginni Rometty. 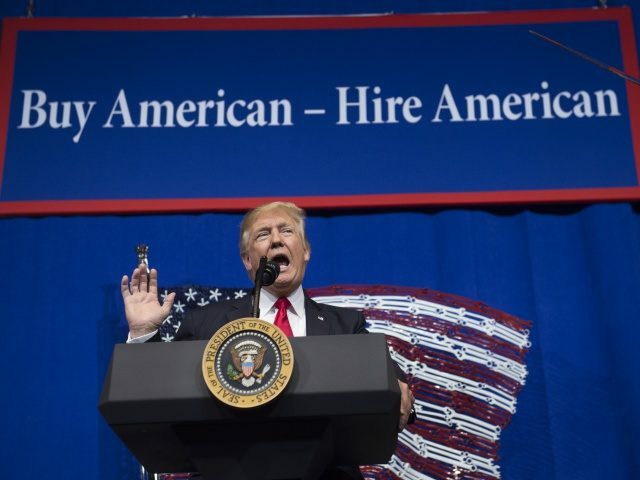 Just months before, Trump’s United States Citizenship and Immigration Services (USCIS) agency described a plan to reduce the outsourcing of American jobs to foreign workers through the H-1B visa program. Trump’s tweet, though, reversed his “Buy American, Hire American” anti-outsourcing stance, instead endorsing a “pathway to citizenship” for H-1B foreign workers and writing that he wants to “encourage” foreign workers to come to the U.S. to take American jobs. While American worker advocates have blasted the tweet, they acknowledge it is somewhat of an inevitable outcome from an administration that they say has shunned its populist-nationalist supporters. “We’ve been silenced a lot since President Trump has actually taken over the White House,” Blackwell contends. When it has come to staffing, a few allies of Trump’s immigration and economic nationalist agenda have told Breitbart News that they have attempted to get jobs in the administration but ultimately failed. Jay Palmer — a visa fraud expert and whistleblower against Indian outsourcing firm Infosys — questioned whether senior Trump adviser Stephen Miller was supportive of the pro-outsourcing plan outlined by the president in the tweet. “If [Miller] is [supportive of this plan] it is disturbing after all the time and information I have provided to educate him over the years,” Palmer told Breitbart News. Miller, nonetheless, remains one of only two champions that the outsourced American workers see in the Trump administration. In 2017, Blackwell attended a meeting at the White House on the very issue of the H-1B visa and its negative impact on U.S. workers. She was invited by Miller. Howard University Professor Ron Hira, a longtime critic of foreign guest worker visas, was in attendance as well. Fast forward to today: Blackwell and her army of laid off and outsourced American workers say they have no contact with Miller. It’s a position that outsourced U.S. workers are accustomed to: Voiceless, alone, and left with threats from multinational corporations not to speak out, keeping them isolated. “Stephen Miller is still in the White House, but other than that, he doesn’t communicate with me or any of the people that I’ve been working with,” Blackwell said. USCIS Director Lee Francis Cissna is the only Trump administration official that has remained in touch with the whistleblowers, the U.S. workers, and the advocates against outsourcing through visas, they assert. The problem the U.S. worker advocates run into with their strong relationship with Cissna is the restrictions he is bound to by his job title, they tell Breitbart News. “I have lost all contact with everybody except for the USCIS Director Cissna, but he’s only able to enforce the laws as they are written and he’s done a fantastic job,” Blackwell said. Cissna has attempted to tighten up the H-1B visa program through regulatory changes. Those reforms have come to a screeching halt, for now, Breitbart News is told. “[Trump] really did cut off the ties with the people who were on this side,” Blackwell said.